Page Builder – Renown comes with a fully integrated Visual Composer that will save you tons of time creating your content and will let you build unlimited number of page or post layouts with a drag and drop easiness. page layout is now a piece of cake. No more CSS hard coding – you will be able to modify all those with Color Picker, Font Size sliders, Font Family dropdown menus and so on. Sounds great? Did we mention it all comes with a live preview so you can see the result before even saving changes? Now, that’s awesome! Responsive and Retina Ready Design – Renown is a fully responsive and retina ready design that looks good on any modern mobile device like iPhone, iPad, tablets, smartphones, laptops, Macs, PCs and so on. Extensive Theme Options – Take a total control over your theme. Renown comes with a powerful Theme Options panel where you can change any aspect of the theme. It comes with a Backup feature that will let you save your current options and load them anytime later. Tons of Shortcodes – Renown comes with a huge amount of shortcodes so you can build any page content you wish. Each of them is available with a one click dropdown menu directly in the Page/Post content editor! Visual Shortcodes Generator – Create more complex shortcodes like Toggles, Accordions, Tabs, Team Member or Buttons with a Live Preview with our awesome Visual Shortcode Generator. Extensive Documentation – With a very detailed theme documentation, you won’t have any problems setting your site up. Each part like Theme Installation, Creating Portfolio, Creating Blog, using the Page Builder and much, much more is very well described. See it live before you buy! Installation Screencast – Prefer a video assistance? No problem. We’ve included an Installation Screencast. One click demo content – Prefer to build your site based on the content you can see in the theme’s live preview? Just import the included demo content and enjoy. Powerful Portfolio – Multiple column layouts, two different thumbnail styles, masonry grid, tons of post and gallery options – create and present your portfolio with a class. 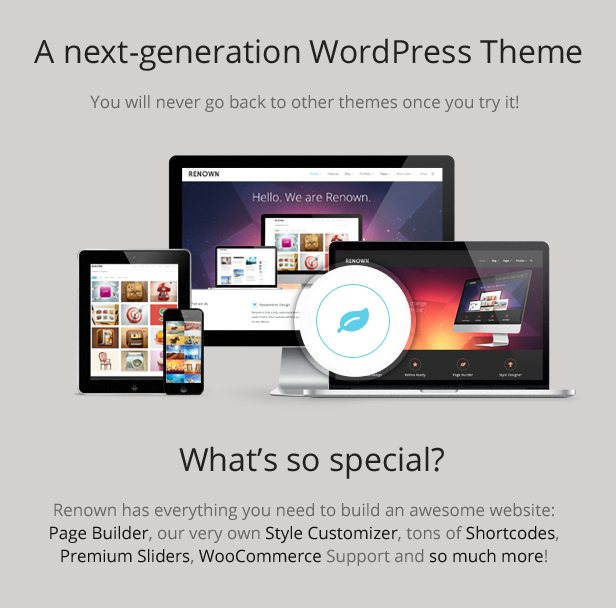 Blog – Renown offers three different Blog Layouts: Default, Classic and Grid. Connected with six different post formats (standard, gallery, quote, audio, video, link) and different page layouts to choose from, you will be able to build a blog just the way you want it. SEO – The theme uses a valid HTML5 markup, special heading tags for page and section titles and follows other good practices that will make it much easier for search engines like Google index your website. Headers – Renown comes with three different Header styles. It’s also really easy to modify the page title (page heading) and make it unique for each of your pages. All that with Color Pickers and intuitive interface. Top Bar – Need an extra space above the header to put some welcome text, contacts, menus or social icons? Just enable the Top Bar and fill it with the content of your choice. Premium Sliders – Theme comes with two most popular premium slider plugins out there: Revolution Slider ($19) and Layer Slider ($18). Both of them make it a $37 value! Unlimited Sidebars – With a built-in Sidebar Manager, you may create as many sidebars as you only need. Would you like a different sidebar on each of your pages? No problem! 600+ Fonts – With a built-in Google Fonts library support you can choose from a wide variety of over 600 different fonts to use on your website. All of them accessible with a dropdown menu and a Live Preview! Font Awesome Icons – Over 400 stunning, pixel-perfect icons to be used in any section of your site. Localization and WPML Support – Need your site in multiple languages? Just install the WPML plugin and make it happen. WooCommerce Support – Create a run an awesome shop on your own website! With the most popular e-commerce plugin out there, it will take you no-time to start selling any goods! This is a great theme, simplistic and looks stunning and professional. Would recommend to anyone as it has great flexibility and a easily operated back end. What really impressed me was the customer service, replied to my issues quickly and resolve problems with no effort from me – way beyond the expected call of duty! Thank you! I just wanted to say how great this theme is working out for me. And thank you so much for helping me tweak it just a little to make it double perfect for my site. This has been the best and easiest to use template of the many of I have tried. Great support too. Thank you Filip!!! The theme has just been released! Each future theme update will be listed here. This entry was posted in Wordpress Themes and tagged business, clean, corporate, creative, customizer, ecommerce, gallery, minimal, modern, multipurpose, photography, portfolio, responsive, retina, seo, themes by wordpress. Bookmark the permalink.